Thanks to Little Tiger Press for sending me this book in exchange for an honest review. Years of being a mother, and foster parent, also means years of reading board books to toddlers while recited ABC and 123 over and over again. It amazes me how many books there are out there for young kids, but how do you choose? This is where reviews and large online sellers like Amazon and Book Depository really work out. Buyers can share there views on the book as the child can't, and may help you find the one book that your child wants to read again, and again. and again. 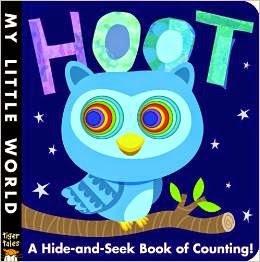 This is a great board book for babies. Strong and sturdy, with ever decreasing cut-out circles for those chubby little fingers. The graphics are bright and cute with each character having their own colour and a name with the relevant letter ( like Rodney Red ) as well as a number on their t-shirts. Kids this young don't need much of a story so don't expect to bond with this book, as you would with Guess how much I love you or similar. It does what it set out to do....... Grabs a baby's attention with the little holes, and with repetition, may just help you teach them their colours and numbers a bit earlier than expected. Tiger Tales have a few similar books, so should you like this one, grab the others, before your child grows up before your very eyes!! !